WHAT: There are few toy lines that have served as inspiration for as many knockoffs as Madballs, and more than two decades after the classic gross-out heads of horror made their debut, the imitations keep on coming. One example of this is a recent set strangely called "Squirt Devil," which appeared over the past few years at bargain stores. Their gimmick is that you can fill them up with water and squeeze them to make them squirt it out through a tiny hole in each of their faces. That's not too exciting, but I have to say these things are pretty good knockoffs just based on their sculpts. While not the most original things, they're well done--especially as far as cheap imitation toys go. I own the three Squirt Devils shown above. From what I have seen I believe there's also a blue one, making it a set of four. They come individually sold in very cheap plastic packages along with a cardboard insert, which refers to them as "Horrible Series" (I have no idea what that means). The plastic is so flimsy that almost all of the Squirt Devils start out completely crushed until you unleash them from the packages and squeeze them back into shape, which luckily doesn't prove too difficult to do. 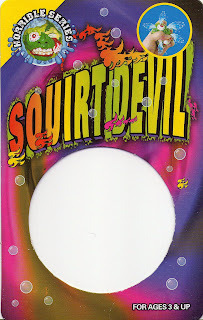 The green Squirt Devil is an obvious ripoff of first series Madball Slobulus. Between the eye dangling out of the socket, the green color and the overall expression, it's clear whoever sculpted this Devil was "inspired" by Slobulus. He squirts water out of his nose. I can't think of a specific Madball to compare the purple Devil to, but my first thought when I saw him is that he looked a lot like a Boglin. I really like all the crazy detail and texture they packed into this one, too. It's my favorite of the three. He squirts water out of his eye. The red Devil appears to take cues from another first series Madball, Bash Brain. To me, he's probably the least memorable of them, but still not too shabby. He squirts water out of his mouth. What do you think of these knockoffs? Do you own any or have you seen any out and about? WHEN: It seems the Squirt Devils first began to appear around 2010. WHERE: They have been available at least in the U.S., at Dollar Tree stores. If anyone has found them anywhere other than Dollar Tree, please leave a comment and let us know. 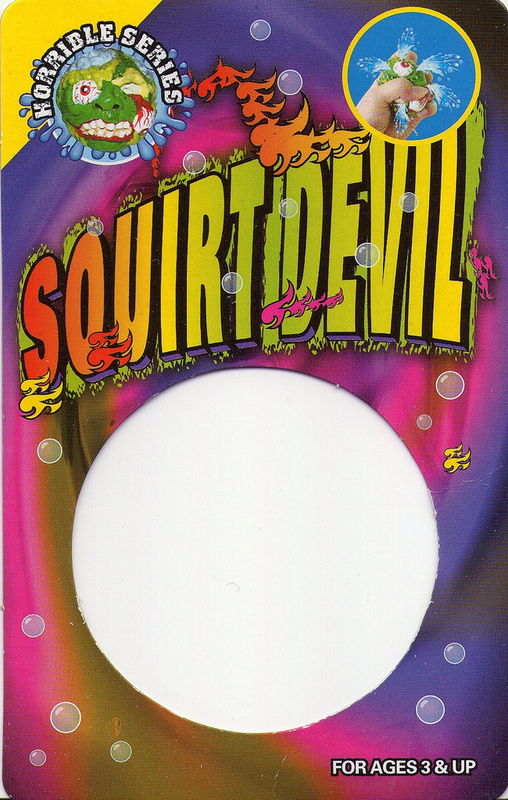 WHO: The only information as to who's behind the Squirt Devils is type on the back of the package's cardboard insert, saying they are distributed by Greenbrier International, Inc. The mental picture of squirting eye-juice is disgusting and awesome. Haha yes, one of the reasons the purple guy is my favorite! I saw these today and they only had red and purple ones so I grabbed one of each. They were free with my initial purchase of 1 dollar batteries as they rang up as nothing .Once I learned they were nothing I went back and grabbed the ones left and bought a 1 dollar lighter .I just got 3 of the purple one and 2 of the red one at the dollar store .So pretty cool deal. You can't beat free. Nice score! So I just found what looks to be the purple one under my desk at work. However instead of squirting it expands an inner bubble when you squeeze it, that's filled with fake blood and bugs. Any idea if there was another series of these?